It's cold and wet and miserable, a time to be huddled up by the fire, warming our hands and feet and generally avoiding the outside as we recover from the extravagance of Christmas and the flooding and power cuts that came with it. However huddling up at home isn't very exciting without a good book to keep you company, and not everyone was lucky enough to get one of those for Christmas. Fortunately, this doesn't have to be an expensive thing to rectify, as I discovered when I visited the seaside town of Whitstable in Kent. 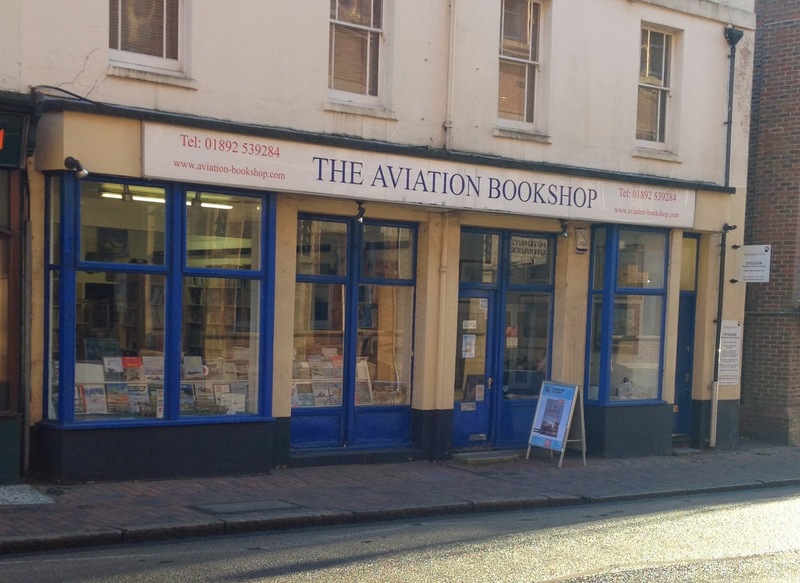 I have to admit, visiting a seaside town in the winter wouldn't be high on my to do list, but I was invited along by the town's reporter, who offered to introduce me to the local bookshops and other delights of the town, and I'm very glad I accepted. I'd heard about Whitstable before, but not really visited properly as stories of nightmare traffic and high prices in boutique shops had put me off. Visiting on a cold Wednesday afternoon, I can't answer to any of those complaints for a sunny summer day, but the regular prices on offer in the bookshops I visited would put the sale offerings of most high streets to shame. First stop on my tour was the independent Harbour Books on Harbour Street. Selling remainders and full price books, I'd been a little wary of visiting this bookshop because of how much I dislike high street remainder bookshops, or should that be shops that happen to sell books. I really should have known better. 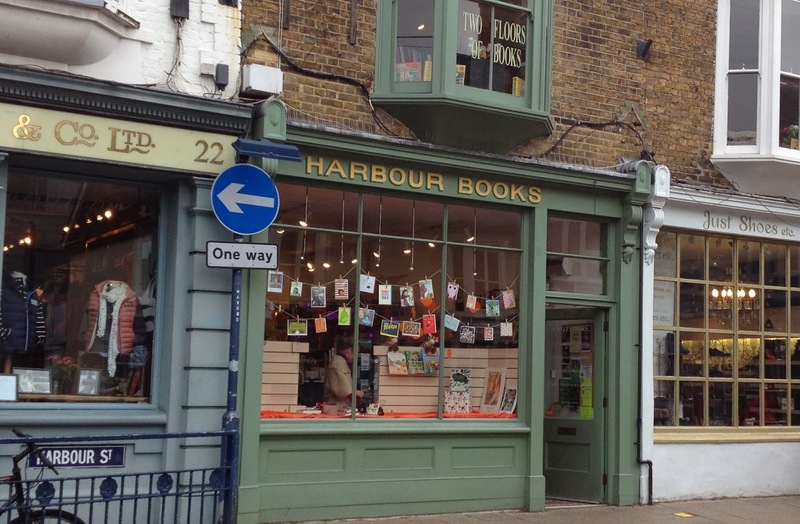 As a follower of theirs on Twitter I already knew Harbour Books regularly crafts some beautiful window displays (my photo doesn't do it justice), what I hadn't expected was a shop crammed with more books than I'd seen in a long time, most of them in a space no larger than my living room. Sure, the shop includes a back room and upstairs, but it was this colourful front room that captured my heart. From recommendations and local interest to general fiction and classics - not forgetting a bright and colourful children's section - there was most definitely something for everyone. 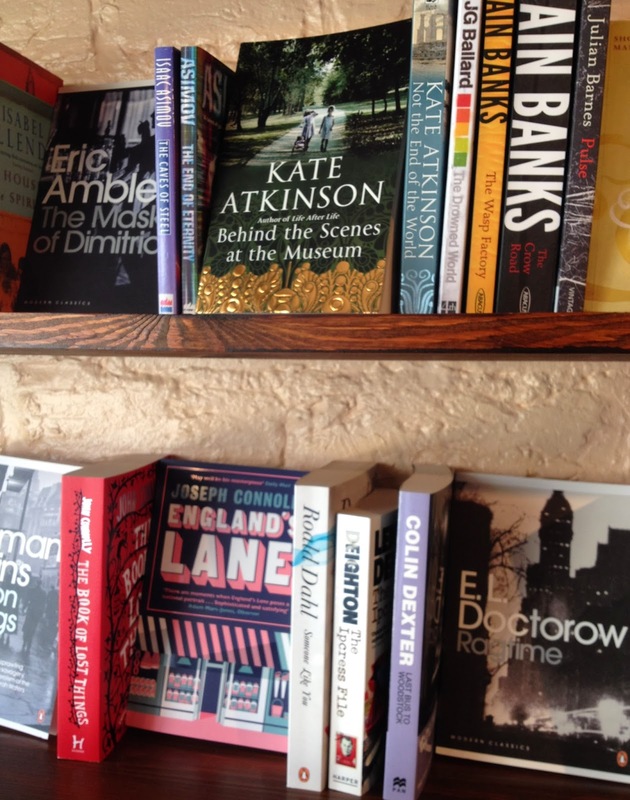 And listening into the conversation at the till where the bookseller appeared to be ordering in new stock, I was definitely in a place that appreciates a good book. And so I appreciated their bookshop even more, taking my time to explore the books before selecting The Stepford Wives by Ira Levin for a mere £2.99. 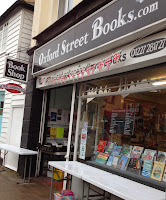 Following a leisurely walk through the town, my next stop was the secondhand and antiquarian Oxford Street Books. In contrast to my first stop, this bookshop was massive. Sprawling through many rooms, each with a different subject, this was a shop to get lost in, and so I did... wandering from science fiction to history, to crime and even a few shelves dedicated to naval and western fiction. I picked up Stephen King's The Stand for just £1.95 and The True Deceiver by Moomin writer Tove Jansson for 95p. Yes, I failed to stick to my one book limit, but at those prices how could I do anything else? Pleased with my purchases, it was time to take a break and go for lunch at the Horsebridge Arts Centre. A wonderful resource for the community, I enjoyed some friendly banter with the staff followed by a warming jacket potato in their cafe. Then, so comfortable was I in my surroundings (I did have a couple of good books to read too) that I decided to dawdle a while longer and sample their cakes and hot chocolate. It was during this second trip to the counter that I noticed a bookshelf by the door. 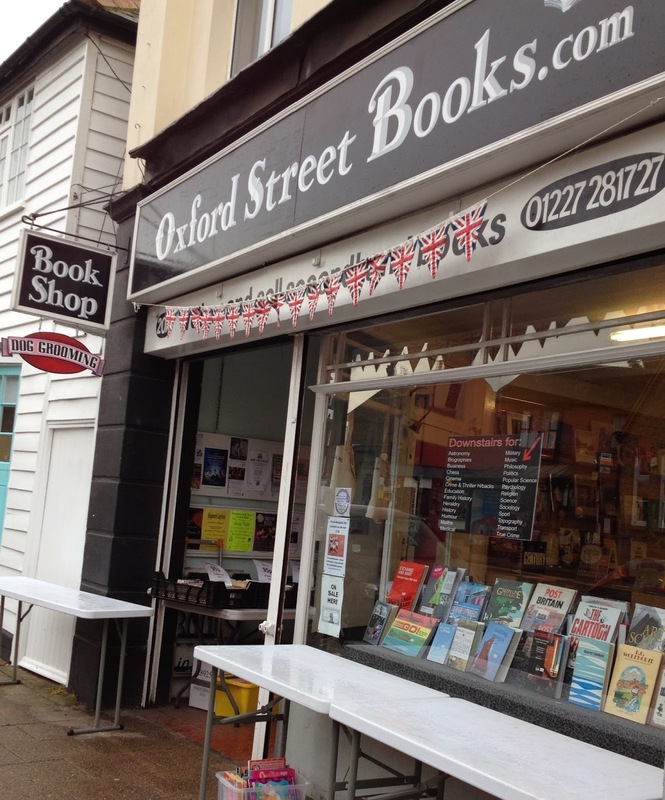 While I know this technically probably doesn't class as a bookshop, I found it impossible to ignore the shelves and soon found myself picking up Danny Wallace's Charlotte Street for a mere 50p - as it's raising money for the centre I doubled my donation. And so, for less than £7, I came away from Whitstable with a haul of seven books. Rain meant I didn't get to enjoy an ice cream by the sea, but with bookshops like this to tempt me back we all know I'll be returning for a 99 once the sun returns. An invitation to a festive tea party put me into a bit of a quandry earlier this month. I knew my host would be providing a selection of homemade baked goods and that - while it wasn't essential - many guests would be bringing their own creations to share. Now I'm perfectly happy to take a hospitality gift when invited to a special occasion, what I'm not prepared to do is take along something that looks like it's been baked by a four-year-old. In fact, my creation would've been worse than that because at least a child is supervised by someone who knows their way around the kitchen. And so I got into a bit of a panic. I spent the train journey to Dulwich half hoping for a delay to give me time to think (remarkably Southeastern were punctual). Which is the state of mind I was in when I entered Village Books. As is only natural, the simple act of entering a bookshop did help to calm me somewhat, but in the back of my mind I couldn't help but feel I shouldn't be enjoying myself until I'd chosen a gift to buy my friend. Fortunately, the bookshop had the answer. Even while looking at the array of baking books I'd not fully appreciated what was in front of me until I saw Great British Bakes by Mary-Anne Boermans and the lightbulb in my brain flashed on. What better hospitality gift could there be for a book lover to give to someone with a passion for baking? Relief washed over me and I was once again able to appreciate my surroundings - including the largest travel section I've seen in an independent (or possibly any?) bookshop, and I was particularly appreciative of the effort to encourage teen readers by giving them a young adult section all to themselves away from the kids. Now I just had to find a book for myself. 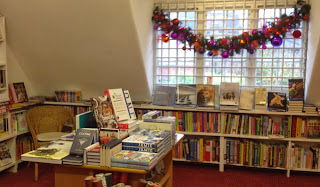 While browsing the fiction it was hard not to notice the buzz in the shop, with a regular flow of customers and friendly booksellers happy to help - one of whom I soon cornered to ask for advice. Wanting to be sure I'd chosen a good gift, and one that wouldn't already be on my friend's shelf, I needed reassurance about my choice and, naturally, we soon got talking about books for me to read too. Within minutes a small pile of recommendations was collected in front of me and I felt truly spoiled. One of the things I love about meeting a new bookshop is that as well as being introduced to new books (many of which have now been added to my must-read list), old - or at least slightly less recent - reads can often be shown to me in a new light too. And so it was the bookseller's enthusiasm for Kate Atkinson's Case Histories that won the day - a book I've always meant to read, this seemed like the perfect time to finally take a copy home. Books selected, it was time to pay. As I was buying a gift, I'd also picked up some tissue paper wrapping, but as I was paying the bookseller told me about their free gift wrapping service and - as you can see - did a much better job than I'd ever manage. Having entered the bookshop a nervous mess, I left with a book for me, a gift for my friend and a smile on my face: I was ready for an afternoon of civilised socialising and more festive tea and cakes than I ever thought possible. Sometimes, all you want is to escape, to hide in a cosy nook where you can relax and forget about everything going on around you. Such a haven is just what I found at Wheeler's bookshop, but first I had to get there. Driving through beautiful countryside on a crisp autumn morning, it was hard to believe I was just over an hour from my urban home as I marvelled at far-reaching landscapes, golden trees and a stunning selection of English country villages, linked to one another by winding lanes. My destination was Midhurst, an attractive market town found pretty much in the heart of the South Downs National Park. Packed with independent shops and period homes (many of which I'd really like to live in if someone has a spare half million), it was a delightful, relaxing place to explore. 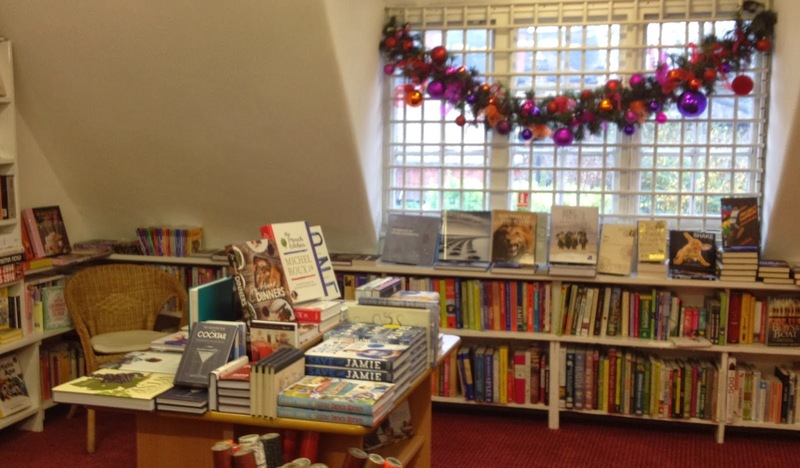 Not far from the high street, Wheeler's bookshop felt like a cosy retreat from the moment I stepped through the door. Its front may have been two large windows, but the atmosphere of warmth and cosiness - and the wonderful selection of books - made it easy to forget the outside world. The first books I saw were, naturally, in the fiction section, and immediately the bookshop got a big thumbs up. 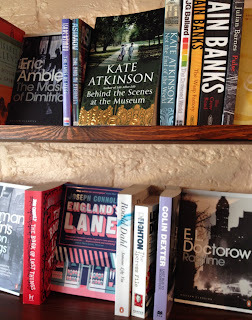 As you''d expect this included a mix of best sellers and old favourites, but I also discovered a truly eclectic mix with the likes of Isaac Asimov, Julian Barnes and Len Deighton all sharing the same shelves. Science fiction doesn't seem to be all that common in independent new bookshops, and so to find everything all mixed in together really piqued my interest and helped me to consider a wide selection of books without having to wander between a number of different areas. Not that this stopped me from exploring. In the children's section, a rocking horse looked at home among the period features and must surely be a delight for youngsters - perhaps this is as much a retreat for young and grown up alike? It was near here that I discovered the first of the chairs that was crying out to be curled up in. Next to what must once have been a fireplace but was now decorated with flowers and books, I struggled not to stop and read. Moving upstairs, the secondhand section is found in a series of rooms decorated with books, scattered with lamps and - importantly - more sofas and comfy chairs where I could relax and escape. Larger than the shop downstairs, this area managed to feel both spacious and cosy at the same time, as each doorway opened into a new room and subject. Aware I had to eventually leave my retreat for the real world I found it impossible to go without taking two books with me. The first was The Year of the Hare by Arto Paasilinna, a book about leaving everything behind somehow seemed an appropriate purchase for such a country retreat, at the till it was then praised by the bookseller too, reaffirming my choice. (Incidentally a lovely conversation revealed her to be the mother of the current owner, who had taken over the family business, have I mentioned how much I love chatting to booksellers?) My second purchase was Books Do Furnish A Room, taken from the fireplace display, it's served as a reminder of this stunning bookshop and also an inspiration in my own home (aka an excuse to buy more books). Now I just have to use that second book to create my own reading retreat at home.